The heart and soul of this ministry’s vision, can be stated in one simple phrase: “It’s all about SOULS.” A familiar phrase in the halls of Marilyn Hickey Ministries, it encompasses what Marilyn Hickey and Sarah Bowling, their ministry staff, and their Ministry Friends and Partners desire: to reach souls around the globe by covering the earth with the Word. Marilyn and Sarah’s passion for lost souls often leads them to difficult places, including Muslim nations and lands oppressed by communism, cruel dictators, poverty, disaster, and disease. Year after year, they cross unfriendly borders with Bibles, teaching materials, and books translated into native languages, often at great personal risk. They have carried the gospel into scores of nations including Pakistan, Italy, Morocco, Ethiopia, Sudan, Russia, Panama, Australia, China, Germany, India, The United Kingdom, Vietnam, and dozens more nations—over 137 in all for Marilyn and more than forty for Sarah! 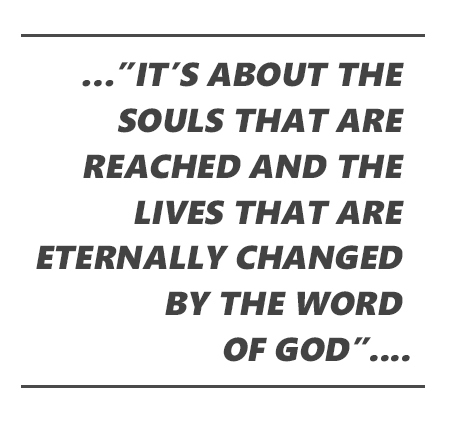 Yet, it’s not about the number of nations visited; it’s about the souls that are reached and the lives that are eternally changed by the Word of God. Since the day that God called her to worldwide ministry, Marilyn has been ‘at the ready,’ always eager to minister wherever He sends her. Marilyn and Sarah have traveled the four corners of the world, reaching souls, touching hearts, and impacting nations with the gospel!